Over the past couple of years our museum has undergone a lot of badly needed changes. Located on the lower level of the Mt. Morris Village Hall (which was called the “New Addition” to the old original grade school) are several class rooms. On the south side of the hall the rooms were combined into one large room that serves many purposes, including holding elections. On the north side of the hallway are three classrooms that have been connected by opening up the walls with large archways. Now the museum rooms are all connected together. The old boiler system and all the hot water heating and pipes had been removed several years ago leaving the ceiling with large holes. Ceilings and lighting were in bad shape, so a plan was put together to make the area more appealing and also energy efficient. Volunteers did 95% of the work with the Village providing the needed materials. It took a lot of work to move all the many items in the museum around so work could be done, and everything had to be moved many times to complete the job. Over the next couple of years things were slowly improved. The outside basement walls were framed out, insulated and drywalled. The old lighting and ceilings were removed, and new suspended ceilings and lighting were installed. Walls were painted, and the new archways were trimmed out. The last task completed was the installation of new carpeting for the floors. At last we now have a beautiful, well lit space to display the many items that belong to the museum. The collection includes many trophies from the Mt. Morris Schools athletics, music contests, and clubs from over the years, many of which are very old and priceless. We also have many photos, yearbooks, old school records, etc. in our collection. We received several computers from the Printing Plant when it closed. They have been networked together, and our plan is to scan all of the photos so we have digital copies and can also present slide shows when we are open to the public. 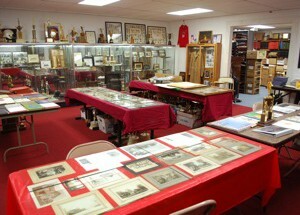 The museum is home to many items from all facets of Mt. Morris history. More items have been donated to the museum over the past year, including items from Watt Publishing and a huge collection of historical objects from the old Kable Printing Plant that kept our town thriving for 113 years. There is a LOT to see at the museum; too much to describe here, and new items are being donated all the time. Currently we don’t have routine hours that we are open. We do open for special events like elections and over the Fourth of July. We can also open the museum for special groups/events. We plan on having some scheduled times of operation in the future.